The Explore Off-roader is very popular with children. The Off-roader is targeted at 2 to 5-year-olds, where each play activity is adapted to the children’s naturally creative, physical, cognitive and social development. The Explore Off-roader was developed in collaboration with children – in a so-called co-creation design process, where the children’s input was crucial for the final design of both the off-roader and the numerous play activities. The off-roader has been tested as a prototype several times, and along the way, we have learned more about how children play, so that we have been able to improve the various activities and provide even better play experiences. From the driver’s seat, several children can operate the Explore Off-roader’s controls, with the steering wheel, moveable buttons and the built-in walkie-talkie. 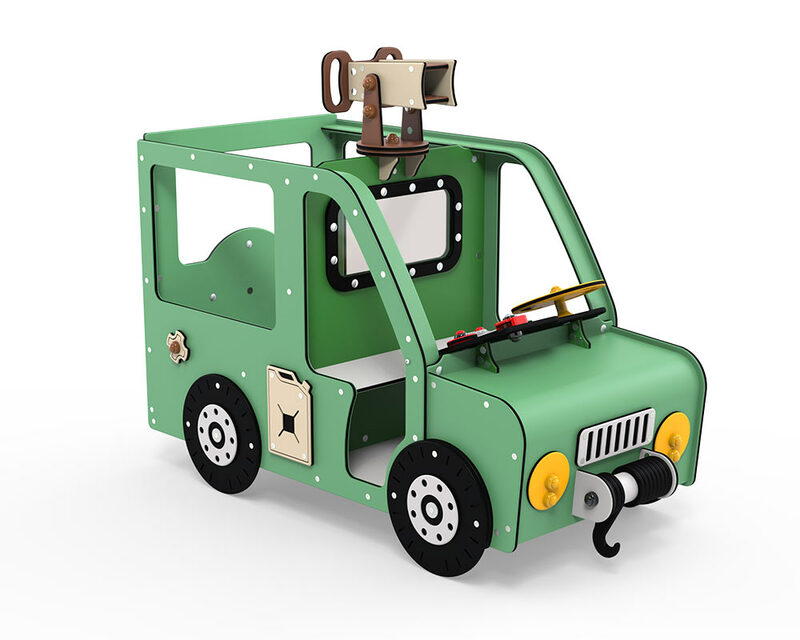 At the front is a moveable towing hook, which also functions as an abacus for number play etc. The headlights also move, stimulating children’s fine motor skills while serving as an element for role-play. At the back, there is space for passengers to sit comfortably and enjoy the view, or to stand and control the vehicle’s telescope. A large window separates the passenger seat and the driver’s seat, yet provides plenty of opportunity for children to interact. From the back seat, there is access to a number of small activities, for example the moveable fuel tank cap and the rotating spare wheel. One of the main advantages of the Explore Off-roader is that it is supplied 80 per cent assembled, so that it can quickly be prepared for action with the accompanying tools. In addition, it requires no special maintenance or safety surfacing.